Spring is in the air and everyone is itching to finally get out of the house and enjoy some warm air and sunshine. Spring is also the perfect time of year to get a new bike. Whether you’re getting your daughter her very first bike or upgrading your own, there are a few things to consider before you bring your new set of wheels home. Below we break down the must-knows for buying a bike for anyone – from tykes to grandparents. The most important thing about buying a bike for your child is making you have the right size. Children’s bikes are measured by the diameter of the wheel, with sizes ranging from 12 to 24 inches. The appropriate size depends on the child’s age and height or leg length. For example, most 2-year-olds start on a 12-inch bike in order to accommodate their shorter legs. To test proper fit, the American Academy of Pediatrics (AAP) recommends children sit on the seat with their hands on the handlebars. They should be able to place the balls of both feet on the ground. Another way to test is to have your child straddle the center bar. They should be able to stand with both feet flat on the ground with about a 1-inch clearance between them and the bar. Don’t forget the helmet! 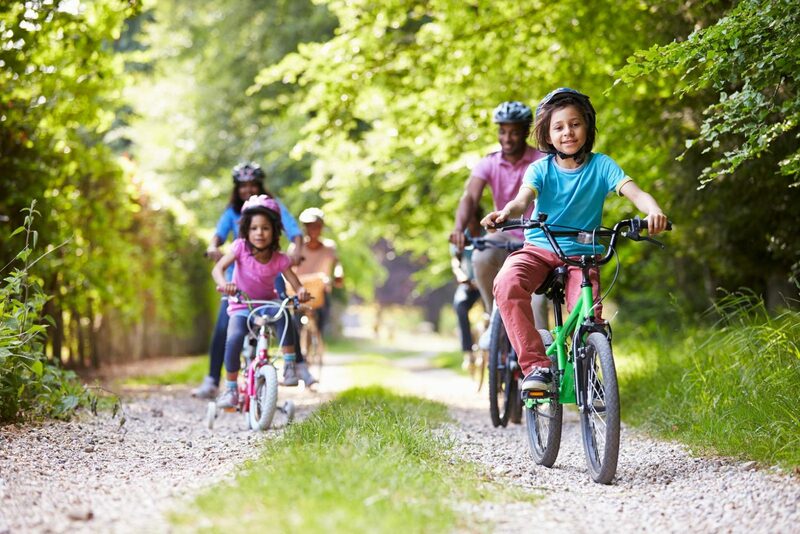 Teaching bike safety is important, especially at a young age, and helmets are a must have for those still trying to find their balance. Sizing is important when trying out adult bikes too. eBicycles has a handy guide to choosing the correct-sized bike based on both your height and inseam. Each type of bicycle has different sizing guidelines, so first determine the type of bike you want. Designed for riding rough, off-road trails, mountain bikes have flat or upright handlebars and a very low gear range for pedaling up steep trails. Most mountain bikes have some type of shock absorbers or suspension. Mountain bikes with front suspension only are called hardtails; those with both front and rear suspension are called full-suspension bikes or duallies. Mountain bikes with no suspension are called rigid and will provide the least “cush” on your ride. Cruisers offer both comfort and style and are built for long, leisurely bike rides. While these bikes won’t win races or power through rough terrain, they are perfect bicycles for family rides and have a nostalgic vibe. If you’re looking for something easy to maintain and that will give you a smooth ride around the neighborhood with your kids, a cruiser is a great option. Road bikes are designed to be ridden fast and on smooth, flat pavement. They have smooth, skinny tires and drop handlebars that are perfect for on-road racing. These bikes are usually lighter than other types of bicycles and are best when ridden on pavement. The lighter, streamlined frame doesn’t absorb much shock, making them uncomfortable and unstable on unpaved trails. Road bikes are perfect for those who cycle for exercise and plan on taking long rides on the road. Before you decide which bike is best for you or your family members, consider the maintenance that could be involved. Depending on where you ride your bike and how often, a protection plan could be a smart way to protect against busted chains, flat tires and other damages. Ask your retailer about what options are available.